For many years, diffusion bonding has been utilized to join high strength and refractory metals that are either difficult or impossible to weld by other means. The process, which involves applying high temperature and pressure to similar or dissimilar metals mated together in a hot press, causes the atoms on solid metallic surfaces to intersperse and bond. Unlike traditional brazing techniques, the resulting bond exhibits the strength and temperature-resistance of the base metals. It also eliminates the need for filler material that affects the final weight and dimensions of the mated metals. Despite its benefits, the use of diffusion bonding has been limited by more practical considerations. Specifically, the size limitation of the furnace chamber as well as limits to the amount, and uniformity, of the pressure applied across the entire surface area of the part. Run times are also long, often lasting a full day. Now, advances in high vacuum hot presses used for diffusion bonding are eliminating many of those constraints. More advanced equipment now provides superior pressure control, feedback from embedded pressure transducers, physical ink tests that show variations in pressure across the surface and rapid cooling systems to improve the bond, increase yields and significantly increase cycle time. This has ramifications for an increasing number of industries. Diffusion bonding is already used to create intricate forms for the electronics, aerospace, and nuclear industries for items such as fuselages, actuator fittings, landing gear trunnions, nacelle frames and nuclear control rods. Today, however, it is increasingly being utilized for new applications for products ranging from turbine blades to medical devices, heat exchangers and even lithium batteries. Typical materials utilized in these products that are welded by diffusion bonding include stainless steel, titanium, zirconium, beryllium, high alloyed aluminum, Inconel and tungsten. The process is also used to weld dissimilar metals like copper to titanium, copper to aluminum, copper to tungsten and even Molybdenum to aluminum. The process is now also being utilized for a revolutionary additive manufacturing process called Laminated Objection Manufacturing (LOM). In this approach, thin 1-2 mm sheets of metal are bonded in what is essentially an additive process. The layered sheets can be laser cut so that when combined together create cooling channels, for example, used to dissipate heat. The final “sandwich” with all its layers can then be machined using traditional CNC turning and milling equipment, if needed. Because diffusion bonding is a product of heat and pressure, the heating elements and integrated hydraulic press play a key role in the quality of the final join. The pressure is applied by a hydraulic press or dead weights. Because the two mating pieces must be in intimate contact with each other, fixtures are often used. Once clamped, pressure and heat are applied to the components, usually for many hours. Since oxidation can also affect bonding, most heat treatment furnaces operate under a high vacuum. While these are common elements of the process, the missing piece to date has been precise control of each. In the case of the pressure applied, for example, integrated single cylinder hydraulic presses can apply a consistent, measurable amount of force, but this provides very little control over large parts with more complex geometries. To compensate, thick graphite pressing plates (10”-15” in height) must be used to mate the layers of metal together at a more consistent pressure. Unfortunately, this takes up furnace space while adding to the time to heat up the surfaces of the metals. Today, however, leading manufacturers such as PVA TePla of Corona, California, offer multi-cylinder systems with large pressing plates that can accommodate a variety of parts. The largest, the company’s MOV 853 HP can process parts as large as 900mm (35.43”) x 1250mm (49.21”), which is quite large for diffusion bonding. The pressing force is 4,000 kN. By controlling each cylinder independently, the integrated press provides extremely consistent pressure across the entire surface. The MOV also comes with built-in pressure transducers along the bottom of the pressing plate. Based on the readings, the individual hydraulic cylinders can be adjusted to achieve uniformity even over large areas. PVA TePla has optimized a physical ink test method that can be performed to identify areas on the part where uneven pressure is being applied. 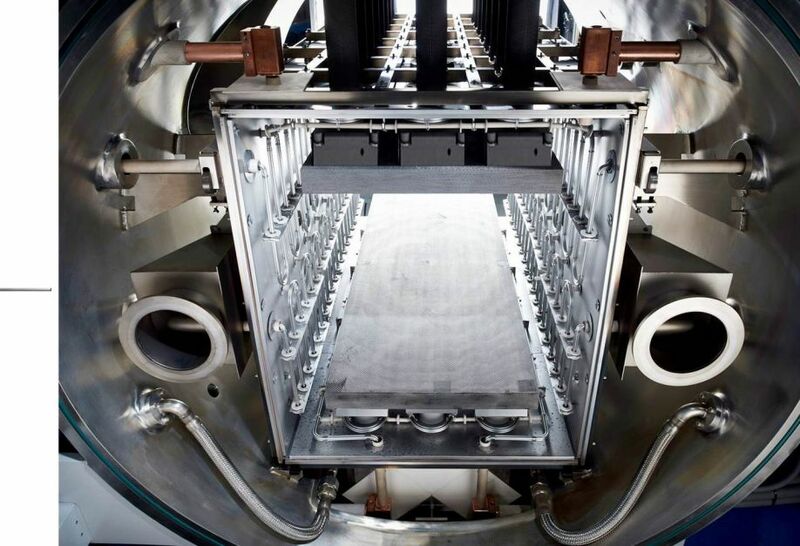 For greater temperature uniformity, the MOV system utilizes six heaters for temperature uniformity within the chamber, instead of the usual one or two, for a maximum operating temperature up to 1,400°C. Rapid cooling quickly brings temperatures down so parts can be removed in about half the time without risk of cracking or other damage. With superior temperature control and multiple hydraulic cylinders in the press, much thinner fixturing plates (less than 3”) can be used, freeing up space in the furnace and allowing for increased cycle times due to faster heating of the surfaces to the desired temperatures. Today the diffusion bonding process is being used for a new additive technology called Laminated object manufacturing (LOM). This has tremendous potential applications for conformal cooling. Parts are designed using traditional 3D- CAD modeling programs, then divided into 2 layer sections that equal the thickness of each sheet of metal. The processing time is similar to 3D-printing with a similar investment cost. However, larger parts, with no restriction in regard to materials, can be produced. One prime example of the additive process of diffusion bonding is for heat exchangers, which are usually made from aluminum. Blend circuit heat exchangers are typically made of stainless steel or even titanium and titanium alloys. With LOM, the concept is to bond layers of sheet metal that contain machined micro-channel structures. When combined, the channels can provide for cooling or heat dissipation. The layers can be bonded up to a height of 600mm in the MOV diffusion bonding press retaining the strength as the parent materials. Another application related to conformal cooling is for plastic injection molds made in 2-layer designs of tool steel and material such as stainless steel (STAVAX). Conformal cooling channels are cooling passageways that follow the shape or profile of the mold core or cavity to perform a rapid uniform cooling process for injection and blow molding processes. With the multi-layer LOM design, more complex cooling channel designs can be incorproated into injection molds, allowing for higher pressures to be used. This significantly increases cycle times as much as 40% while enhancing product quality. Whether applied in layers or simply to bond two parts, the diffusion bonding process is an ideal process for joining refractory and other high strength alloyed materials together without the need for brazing. Although it has been around for decades, with more precise control of temperature and the uniformity of pressure across large parts, diffusion bonding opens up tremendous possibilities for a variety of next generation products.